Personally, as long as I can remember, I have always tried my best to avoid shopping. It is just frustrating to choose clothes that look nice, are trendy and at the same time looks good on you. That is why shopping trips can take hours and there are dozens of things I can do instead of shopping, for instance binging on Netflix or Xbox! Therefore, whenever the season changes, I get anxious because I know that now I have to go shopping again. The wardrobe is a very important part of our lives and I have learned it the hard way that we can not neglect it for long, as appearance does make impressions and you always want to leave a lasting impression on others. Therefore, pushing my shopping anxieties aside, I had to learn to how shop according to the season. And after many springs later I finally achieved the dream spring closet within my budget. Spring season is my favorite season because the spring wardrobe is casual and breezy. You don’t have to put extra effort and money on heaps of clothes, while you can look at your best being minimalist. My spring closet is low-key yet enough to make ladies on street swoon. So, if you are the one who struggles with shopping take a look at my spring OOTD’s and I assure your shopping will become 100X easier and you will breeze through spring’19 looking, dapper beau! If you are bit more adventurous and you would like to add some exciting bits to your spring wardrobe floral shorts are the key. The floral printed shorts make-up best picnic attire. You can wear them over t-shirts, polo shirts and tank tops you can twin with sneakers, joggers and canvas shoes. I don’t like to accessorize too much on this outfit because don’t want to attention-getting away from swanky shorts. 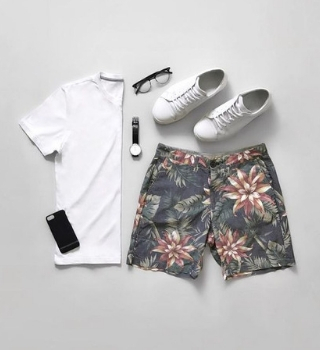 You can get these shorts in a plethora of colors and designs, if you don’t opt for shorts so much you can always grab some floral shirts to put a twist on your spring closet. This first devil may care attire is the most essential outfit that every man must have in his closet. 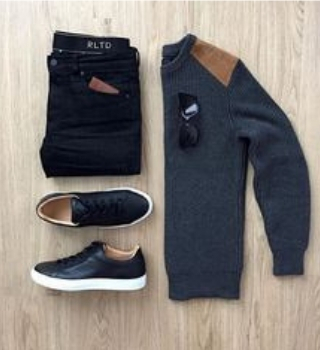 The sweatshirt is casual yet looks presentable at the same time. This sweatshirt is made of light airy fabric which is perfect for spring. 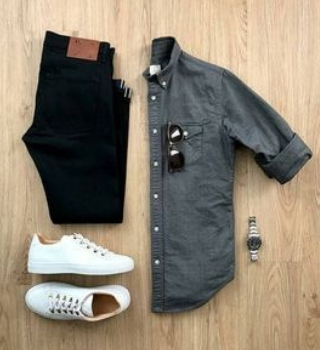 You can pair it up with jeans, chinos or simple cotton pants. I like it to pair it with my navy-blue cotton pants and white joggers to enhance the contrast. you can wear this outfit to class, grocery shopping, go to movies or take your dog to walk. 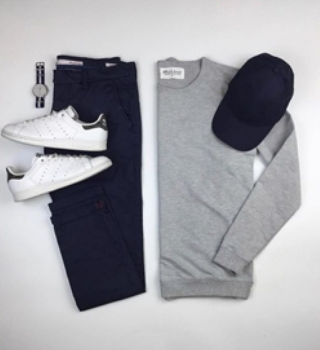 I put on a navy cap on this outfit if I heading out in the day. Again, I like my outfits to be pretty simple and effortless. For the days when it is chillier, I like to wear sweater jeans combo. The sweater is warmer than a sweatshirt and it looks as basic as any shirt. This shoulder patched charcoal sweater is my favorite as it is semi-casual and laid back as any regular outfit. This on the go attire can be worn to your office, school or on your third date and you will never get any complaints. I pair it with my black slip-on shoes and a pair of Ray-Bans when the sun decides to shine. The spring evenings are unpredictable; one day it can be blowy and cozy yet another day it can get a tad bit frosty, so you have to have some outerwear as well. I have reserved this jacket for cold evenings. 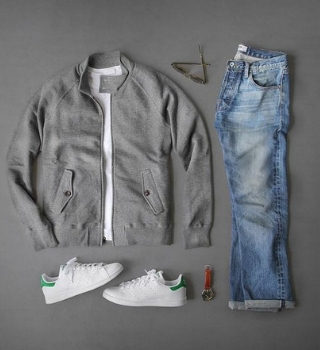 The warm jacket can be layered over a t-shirt, sweatshirt, button-up shirts and can be twinned with a variety of pants. I like to wear it over a plain t-shirt and faded jeans and with my favorite white breathable sneakers. The leather strap watch will accentuate this nonchalant garb into a more formal one. When it comes to formal suits the 3-piece suit picture conjures up, but not all non-casual suits are prim and reserved. 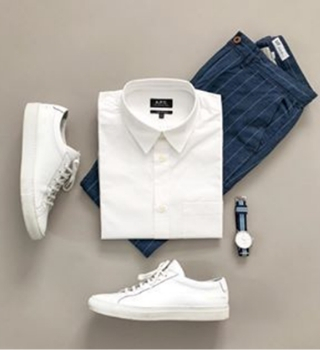 This solemn get-up which consists of a starchy white button up, collared shirt with blue pinstriped slacks and leather strap wrist watch can get you through office meeting, class presentations, meeting your girlfriend’s parent for the first time and formal dinners. This dress is sharp and office-y yet you wouldn’t feel stuffy. 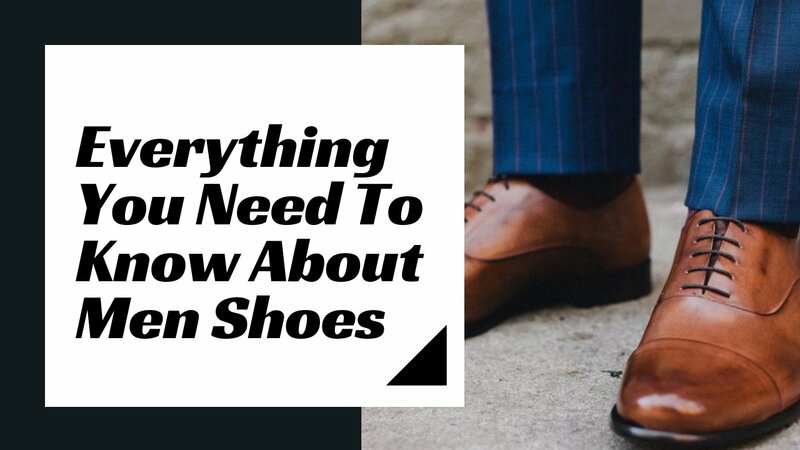 You can wear it over numerous footwears, from boots to dress shoes to sneaker for a casual look. Chinos, the trendy pants for spring’19 are perfect for a day out attire. They are comfy yet chic, you can twin them with a variety of tops which includes t-shirts, sweatshirts, button-up shirts, jackets, and what-not. I have labeled this gear as my day-out wear because it is semi-casual, I can go from the mall to a friend’s place to the beach without changing my clothes the entire day. 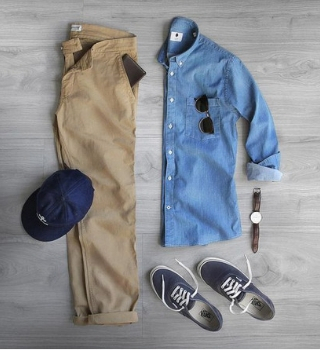 When the sun is out, I wear a cap and my favorite black shades and in the evening I stick with my brown strap wrist watch and blue canvas shoes. Spring is always associated with flowers, breeze and pastel colors. When it comes to men’s wear most us hesitate to wear pink. Nevertheless, I have found that it does not look girlie at all when paired with right pants and accessories. In spring you should gravitate more towards lighter neutrals, not bright colors which are easy on eyes and looks smart. 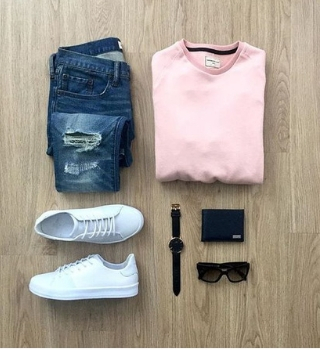 I have to say pink is now frequent in my spring closet I twin it with ripped jeans white sneakers, black shades and watch to add bit more solid hues and voila I am ready for spring. 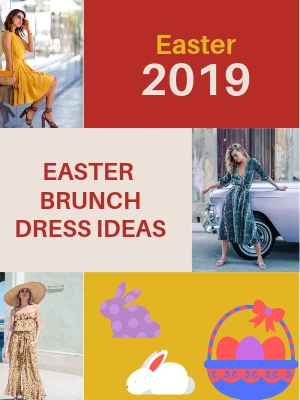 These are some of favorite spring OOTD’s, these are laid-back outfits and each item can be worn separately throughout the year. 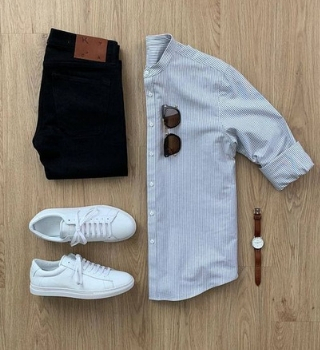 You can add accessories to each outfit of your liking as much as you want, leather belts, sunglasses, wrist watches and a dollop of your favorite cologne. Another thing that I like about these outfits that you can don’t have to hunt for them, these items are easily available in almost every clothing store. You can shop for them on online-stores as well. 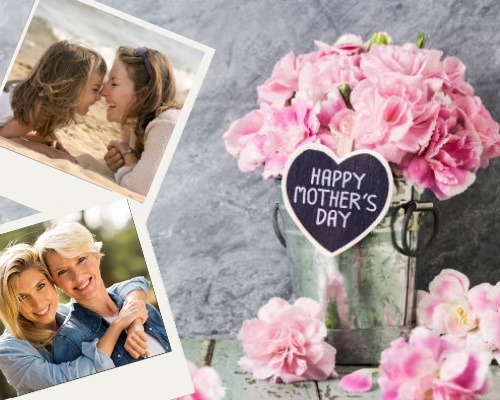 While you are shopping for spring’19 do not forget to utilize saving coupons and promo codes. You will be amazed by how much you can save by getting a discount on your purchase through codes. You can always ask store helpers for discount codes or look for them on saving coupons websites. Also, keep an eye out on sales racks while you are shopping you might get a good deal on your favorite items by checking them out. I hope with these little tricks and tips will smooth out shopping this year and you will manage to steal the title of campus heartthrob. Let me know in the comments which spring outfit do you like the best and why? How do you like to dress in spring if you have more tips to add mention them in the comments?